Join us for our casual and conversational Entrepreneur's Circle at The Hivery! This is another way to make sure you're not going at the business of building a business on your own, but rather with the trusted circle of The Hivery community. This month, we welcome speaking and leadership coach Alexia vernon, the creator of the Spotlight Speaking Community and Alexia Vernon Empowerment, to lead our monthly circle. Whether you are at the start of your career, launching or scaling a business, messily shuffling between work and motherhood, or an established leader looking to develop the women behind you, this one-of-a-kind presentation will move you to speak up for yourself and the ideas and issues that matter most to you. 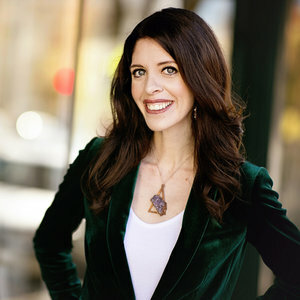 Branded a “Moxie Maven” by President Obama’s White House Office of Public Engagement for her unique and effective approach to female empowerment, Alexia Vernon's equal parts practical, poetic and playful delivery style make her a sought-after speaking and leadership coach. Alexia's new book 'Step into Your Moxie: Amplify Your Voice, Visibility, and Influence in the World' is a soul-stirring call-to-action for women to speak up and out—in their careers, businesses, and homes. Alexia fuses hilarious and at turns heartbreaking stories with mindful and actionable advice for women to slay diminishing self-talk and cultivate the mindset and behaviors to walk into any room (or onto any stage) and use their words to move people to take action. This presentation (and the message of her book) are perfect for high-performing, socially-conscious women who are already busting big moves in the world and are ready to heighten their communication impact, compile practical tools to enhance their presentations, negotiations and day-to-day conversations (particularly the risky ones), and who enjoy a speaker who is wise, witty and full of heart. Reconcile your desire to claim visibility with the insecurity increased visibility often triggers, so you can move forward - fast. Reclaim the role of protagonist in your own story and lay the foundation for empowered self-talk and influential communication. Speak your truth to communicate what you want clearly - and with empathy and compassion - so others can act on your words. Adopt a growth mindset to experience setbacks as opportunities that allow you to cultivate resilience and grit. The Entrepreneur's Circle is one of The Hivery's monthly member events. Mark your calendar for the third Thursday of each month from 12:30 to 1:45pm to join this program. Alexia Vernon is a sought-after speaking and leadership coach, consultant and trainer. Alexia is the creator of the Spotlight speaking community, and she has supported thousands of speakers through her online trainings, live events, The Spotlight Speaker Accelerator coaching program, and her premier mastermind, the Spotlight Speakers Collective. She has presented transformational keynotes and corporate training for Fortune 500 companies and professional associations, spoken at the United Nations, and delivered a TEDx talk on the future of feminism. She is the author of Step into Your Moxie: Amplify Your Voice, Visibility, and Influence in the World (New World Library and Penguin Random House Audio). She has gotten her gab on with media including CNN, NBC, ABC, CBS, Forbes.com, Inc.com, European Business Review, and Women’s Health Magazine. Alexia holds graduate and undergraduate degrees in women’s studies and began her career teaching women’s studies at several universities. She lives in Las Vegas, Nevada with her partner in business and life, Stephen, and their precocious, wide-eyed, preschool-aged daughter. Learn more about Alexia Vernon here.